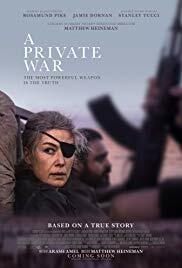 Based on Marie Brenner’s Vanity Fair article “Marie Colvin’s Private War” (screenplay by Arash Amel), the film benefits from the extraordinary and courageous work of Ms. Colvin, and also a terrific performance from Rosamund Pike (words I’ve not previously written). Ms. Pike captures the extremes of Ms. Colvin’s life – the atrocities of war and the self-prescribed treatment of her PTSD through vodka, and does so in a manner that always seems believable. She lets us in to a world most of us can’t imagine. As a war correspondent for Britain’s Sunday Times (since 1986), Ms. Colvin told the stories we’d rather not know. In her words, “I saw it, so you don’t have to.” The film begins with a stunning overhead view of 2012 war-ravaged Homs Syria (destruction courtesy of Assad’s soldiers) – a place that starts the film and later ends the story. We then flash back to 2001 London so we can witness Marie in society and struggling with a personal relationship. She then chooses, against her editor’s (Tom Hollander) guidance to cover Sri Lanka. It’s a decision that cost her an eye, while also providing her recognition as the eye-patch wearing female war reporter. In 2003, a tip takes her to a previously undiscovered mass grave site in Fallujah. This is her first work alongside photographer Paul Conroy (played by Jamie Dornan). Having “seen more war than most soldiers”, Ms. Colvin’s severe alcoholism can’t kill the nightmares, visions, and PTSD. After time in a clinic, she returns to work. We see her in 2009 Afghanistan and then pulling no punches when interviewing Libya’s Muammar Gaddafi in 2011. During these assignments, we learn much about Ms. Colvin’s personality and approach. She is rarely without a cigarette, admits to wearing Le Perla lingerie (and why), carries Martha Gellhorn’s “The Face of War” as her field manual, and wins two British Foreign Journalist of the Year awards – though seeing her at the banquets is quite surreal. Hollander’s subtle performance as news editor Sean Ryan is also quite impressive. He fears for her safety (and even questions her sanity) but is in constant conflict with the need to sell newspapers – something Ms. Colvin’s stories certainly did. Stanley Tucci has a role as Tony Shaw, her love interest, but despite her words, we never believe he and his sailboat are ever more than a distraction from her obsession with the front lines. The final sequence in 2012 Homs Syria is stunning, as is her final interview with Anderson Cooper on CNN. Ms. Pike has altered her voice to mimic the deeper tone of Marie Colvin – her efforts confirmed in the final interview played at the film’s end. It’s quite a career boost for Ms. Pike, who has previously been known for playing ice queens in films like GONE GIRL. She captures the traumatized Marie, but also the obsession of someone whose DNA constantly drove her back to the stories that needed to be told. Director Heineman’s unique perspective combined with the cinematography of 3 time Oscar winner Robert Richardson (a favorite of Scorcese, Tarantino, and Oliver Stone) delivers a realism of war that we rarely see on screen. Mr. Richardson also shot SALVADOR (1986) and PLATOON (1986) and his work here surpasses both. The film gives us a glimpse at the psychological effects of such reporting, and a feel for the constant stress of being surrounded by tragedy and danger. This is fitting tribute to a courageous and very skilled woman, although I do wish the men weren’t constantly helping her out of trucks and jeeps. We are introduced to British High Court Judge Fiona Maye (Thompson) as she announces her opinion on a case involving conjoined twins. As an expert in family law cases, Judge Maye is respected for fairness and decisiveness. Just as the reality of her crumbling marriage to Jack (Stanley Tucci) hits, she is drawn into yet another case where emotions (and media) are running high. Adam (Fionn Whitehead, DUNKIRK) is in dire need of a blood transfusion, which his Jehovah’s Witness religion and parents will not allow. Greetings again from the darkness. Geoffrey Rush is such a uniquely talented performer that I wouldn’t hesitate to walk into any of his projects with little hint as to the subject matter. He is simply that good at what he does. Here he plays renowned Swiss sculptor and painter Alberto Giacometti, a man Rush seems destined to play given their quite similar physical appearances. It’s a 90 minute joy ride (though it’s not really joyful) for anyone who enjoys watching an artist work … or in this case, an artist working as an artist. Writer-director Stanley Tucci is best known for his acting career, and he also has an eye for the camera and clearly admires Giacometti and his work. Set in 1964 Paris, most of the film takes place in Giacometti’s shabby little compound that includes his studio and a bedroom he sometimes shares with his wife Annette (Sylvie Testud). Occasional forays take us to his favorite café, or walks through the city by his latest portrait subject, the American art writer James Lord (Armie Hammer). 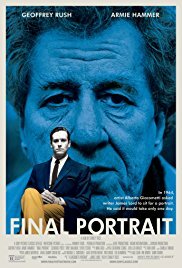 In fact, the film is based on Mr. Lord’s memoir “A Giacometti Portrait”, which details his experience posing for the master … a task that was originally promised to last a couple of hours, and turned into 3 weeks. Also appearing are Tony Shalhoub as Diego, the artist’s brother and assistant, and Clemence Poesy (IN BRUGES) as Caroline, a local prostitute who also serves as Giacometti’s muse. It’s a fine and talented cast, but this just as easily could have been a one-actor play. Rush plays the lead as a typical artist in shambles – one who cares as little for relationships as he does about money, clothes and appearances. He’s perpetually rumpled with mussed hair and a dangling cigarette being his sole accessory. He is both charming and miserable, sometimes in the same breath – unwittingly pitting his forlorn wife against his more pampered muse … never more obvious than when comparing gifts of a new dress versus a new BMW. Much of the time on screen is spent in the daily ritual: adjusting the chair just so, Lord sitting down and assuming the pose, an artistic gaze cast, followed by the careful selection of a particular brush. More often than not, Giacometti mutters an “Ahh F***”, and proceeds to start over (and over and over). An honored yet frustrated Mr. Lord is forced into numerous flight reschedules, as time means nothing to an artist. Director Tucci shoots through the smudged window panes more than once, and when Giacometti tells Lord, “I’ll never be able to paint you as I see you”, it really captures the tortured madness and brilliance of such an amazing artist. He doesn’t see the world the way most of us do, and that’s what sets his art apart. Of course the personal toll on the man and those around him is quite high … Giacometti passed away less than two years after the Lord portrait. Greetings again from the darkness. An entire generation still enjoys their childhood animated movie memories thanks to Disney’s The Little Mermaid (1989), Beauty and the Beast (1991) and The Lion King (1994). We are now a quarter-century later and Disney is looking to re-create the magic (and hopefully cash in) with Live Action versions of all three …as it did with Cinderella (2015) and last year’s The Jungle Book (sensing a trend?). 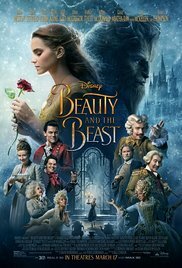 Up now is director Bill Condon’s mixture of live action, CGI and music for Beauty and the Beast. The 18th century story (1740) by Gabrielle-Suzanne Barbot de Villeneuve was re-written and shortened by Jeanne-Marie Leprince de Beaumont after Barbot’s death. Director Jean Cocteau’s 1946 French film version looks to have been a key influence for this updated ‘Beast’, while the 2014 version with Vincent Cassel will probably now be rendered forgotten. Screenwriters Stephen Chbosky (The Perks of Being a Wallflower) and Evan Spiliotopoulos (The Huntsman: Winter’s War) team with Oscar winner Condon, whose musical movie resume includes Chicago and Dreamgirls, to inject some contemporary aspects to Belle’s personality, as well as a bit more backstory for quite a few characters … all while staying true to the 1991 version. Emma Watson proves a nice choice for Belle as she has what it takes to be nice yet tough, while still being an oddball within her own community. Belle is a bookworm who dares to help other girls to read, while also being the brains behind her father’s (Kevin Kline) work. She realizes her neighbors view her as a curiosity – and there is even a song to prove it! Ms. Watson brings strength, independence, and courage to the role. These traits and others are on full display even before her first encounter with the beast. Dan Stevens (“Downton Abbey”) is the beneficiary of an extended backstory for the Prince, which includes a large dance and musical production at the castle, leading to his being cursed for having no love in his heart. Most of the scenes with Beast utilize CGI for the face and head. This effect worked for me as I found the look fascinating and able to fulfill the necessary emotions, though the non-beast Prince would be considered the weakest link in this fairy tale chain. Since the comparisons to the 1991 version are inevitable, and certainly a matter of personal opinion, Luke Evans made a wonderfully pompous Gaston, while Josh Gad was quite humorous as LeFou, Gaston’s loyal sidekick who is also the center of the misplaced controversy (not worthy of discussion here). The staff – both live versions and special effects – includes Ewan McGregor as Lumiere, Ian McKellan as Cogsworth, Emma Thompson as Mrs. Potts, Audra McDonald as Madame Garderobe, Stanley Tucci as Maestro Cadenza and Gugu Mbatha-Raw as Plumette. Each bring their own touch to the roles, with Ms. McDonald being a particular standout, and Ms. Thompson having the most thankless job as replacement for Angela Lansbury. While I found this version quite enjoyable and well done, it’s a bit confusing why the decision was made to go so dark and foreboding. It’s not young kid friendly at all, and seems as if the target audience is millennials who were raised on the 1991 version. This was done at the expense of inviting a new generation to explore the story and characters. Parents should probably avoid taking any kids under age 10 or 11, and the film easily could have received a PG-13 rating. 8-time Oscar winner Alan Menken returns to score the film (he did the 1991 version as well), plus he wrote new songs with Tim Rice and there are some original lyrics by Howard Ashman. With only one viewing, it’s doubtful any of the new songs will be instant classics, but “Be Our Guest” is a definite crowd-pleaser (again). Of course, it’s an impossible task to please everyone when you mess with the classics, but overall, it’s a nice twist for fans of the 1991 animated version. Likely a missed opportunity to bring new youngsters into the fantastical BATB world, it does show that the animated to live action transformation can be well done … and that’s a relief with The Lion King and The Little Mermaid on the way. Dear Disney – don’t mess ‘em up! Greetings again from the darkness. Faith. A word that easily could have been the title of this gripping and heart-wrenching film. Faith can be defined as trust and belief. Faith can also be defined as religion and ideology. Few things are more devastating than broken faith … the core of this “based on actual events” story of The Boston Globe’s exposure of rampant child molestation by dozens of Catholic priests, and the systematic cover-up by “The Church”. 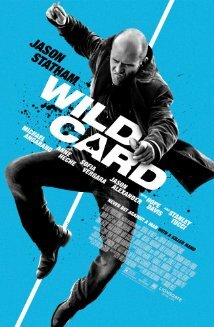 It’s challenging to name a movie that is as well-made as this one, while also being as difficult to watch. We know the story … we even know how it snow-balled globally … but the raw emotions of disgust and sheer anger permeate much of our being as we watch it unfold on screen. Director Tom McCarthy (The Station Agent, The Visitor) co-wrote the script with Josh Singer (The Fifth Estate) and it’s worthy of favorable comparison to other investigative newspaper films like The Insider (1999), Zodiac (2007), and even the granddaddy of them all … All The President’s Men (1976). The opening scene takes place in a 1976 Boston police station. A priest has been accused of molesting a child. Within a couple of minutes we witness the empty promises, the intimidation, and the cover up. So much is conveyed in this brief opener, not the least of which comes courtesy of the ambivalence of the veteran cop as he shrugs it off as ‘just another day’ in front of an idealistic rookie cop. This is accompanied by Howard Shore’s spot-on score, with the best parts featuring only a piano and bass. 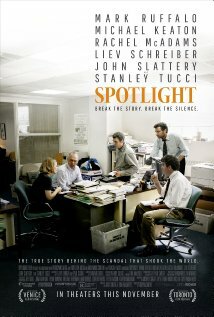 Flash forward to 2001 as we meet the investigative journalist team called “Spotlight”. It’s led by editor Walter “Robby” Robinson (Michael Keaton) and his three reporters: Mike Rezendes (Mark Ruffalo), Sacha Pfieffer (Rachel McAdams), and Matt Carroll (Brian d’Arcy James). They report to Ben Bradlee Jr (John Slattery), whose father was the editor of The Washington Post during the Woodward/Bernstein/Watergate era. New to The Globe is managing editor Marty Baron (Liev Schreiber). Unlike the others, Mr. Baron is neither a Boston local nor a Catholic. In fact, we catch him reading Dan Shaughnessy’s book “The Curse of the Bambino”, just so he can get a better feel for the community and its people. What is most fascinating about the movie is that it focuses on the investigative aspects – just how diligent the reporters were in putting the story together – and how fluid the process was … the story led them, not vice versa. There was no media agenda to “get” the church. Instead, the reporters experienced natural shock as each piece of the puzzle was discovered. One of their key sources was a priest-turned-psychologist (voiced by Richard Jenkins) who helped them put scope to the numbers. Another was Phil Saviano (Neal Huff), the leader of a victim’s group, who had tried before to provide documentation to the press. Saviano is the perfect example of how someone so passionate about a cause can be viewed with such skepticism … right up to the point when they are proven correct. Three attorneys add perspective to the cover-up. Eric Macleish (Billy Crudup) made a career of settling cases (and silencing victims) for the church. Mitchell Garabedian (Stanley Tucci) is the polar opposite – he fights vigorously to get the victims heard, while Jim Sullivan (Jamey Sheridan) is caught in the middle – settling cases for the church and struggling with his conscience. Other interesting characters include Paul Guilfoyle as Pete Conley, a smooth-talking power-broker for the church, and Len Cariou as Cardinal Law – the man at the top who eventually apologized and was rewarded with a high-ranking position at The Vatican. The film is so well crafted and acted that it features more than a few “best scenes”. Sacha has a brief encounter with a former priest on his front door stoop. The priest freely admits to molesting kids and his rationalization will certainly deliver chills to most any viewer. Since this is Boston, it makes perfect sense for the reporters to be so distracted by the story, that it supersedes the Red Sox game they are attending at Fenway Park. Being that the investigation lasted well into 2001, it’s quite informative to watch a news agency shift directions for the September 11 tragedy, and along with the nation, put all else on hold. Finally, there is a point in the movie where we as viewers have just about had our fill of extreme emotions – we either need to hit something or throw up – and reporter Rezendes comes through with exactly what is needed: an emotional outburst and release of exasperation rivaling anything previously seen on screen. It’s a wonderful moment for Ruffalo as an actor, and a peak moment for viewers. The story hit the front page of The Boston Globe in January 2002. The paper won a Pulitzer Prize in 2003 for its superlative investigative journalism. The report vindicated so many who had been taken advantage of, and exposed the colossal arrogance of the church. The innocence of a child vs the power of God. The story broke the faith that so many once held, and started a global (as evidenced by the closing credits) reckoning and awakening that was desperately needed. 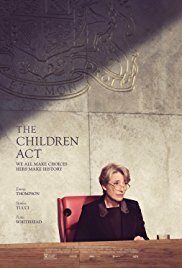 The film offers a line of dialogue, “It takes a village to raise a kid … or abuse one.” In other words, it took the often silent actions of so many to allow this despicably evil horror to continue. In a tribute to the newspaper profession, it took a small group of dedicated reporters to pull back a curtain that should never again be shut. Let’s have faith in that. Greetings again from the darkness. I’m now even further removed from the target demographics than for the first two Hunger Games movies. Regardless, I have read all 3 books from Suzanne Collins’ trilogy and have seen all 3 movies based on her books. Oh, wait. There will be FOUR movies, not three, from her source material. Hello Lionsgate profits! By definition, The Hunger Games: Mockingjay Part 1 is a warm-up act … it’s setting the stage for the finale which will be released in one year. So for this one we get a Hunger Games movie with no Hunger Games. In fact, there is very little combat action at all. Instead, we are witness to the strategic planning and “selling” of a war (think Wag the Dog), replete with short promo videos featuring Katniss (Jennifer Lawrence) as the Mockingjay … the rallying symbol of the rebels. There is a terrific scene featuring four great actors: Jennifer Lawrence, Julianne Moore (as President Coin), Jeffrey Wright (as Beetee) and the late Philip Seymour Hoffman (as Plutarch). Four great actors in harmony elevating a movie based on YA novels. Pretty cool. With no actual Hunger Games, the color palette of the film is almost entirely grays and browns. Even Julianne Moore’s famous red tresses are toned down to a streaked gray. The bleak look reminds of the Metropolis (1927) set, and also makes President Snow’s (Donald Sutherland) vivid white wardrobe and beard stand in contrast to rest. Mr. Sutherland has another juicy scene flashing his devilish grin and twinkle. He’s another example of the perfect casting, which extends to Elizabeth Banks (Effie), Woody Harrelson (Haymitch), Stanley Tucci, and Mahershala Ali (as Boggs). You should expect much less Josh Hutcherson (Peeta) this time, but a little more Gale (Liam Hemsworth). 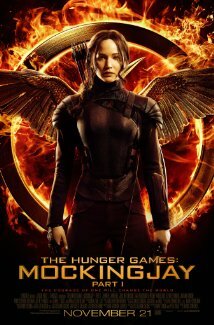 Jennifer Lawrence proves again that her recurring role as Katniss is underrated from an acting perspective. She is now best known as an Oscar winner, but that doesn’t affect the sincerity, emotion and tenacity that she exhibits here. This ending of Part 1 feels a bit awkward, but the break comes at the right time considering how the book is written. If you are a fan of the franchise, just accept that you will be buying a ticket for this move as well as next year’s finale. **NOTE: Philip Seymour Hoffman passed away with less than two weeks remaining in the filming schedule. He will appear in the finale, but his last few scenes were re-written to account for his absence. I will say it again next year, but his death leaves such a void for us movie lovers.